I was contacted this week by a new client that wanted party printables for a Baby Shower and the only request is that I use white, silver and tiffany blue. They also wanted a candy buffet sign, candy bar wrapper, water bottle label and gift tag. 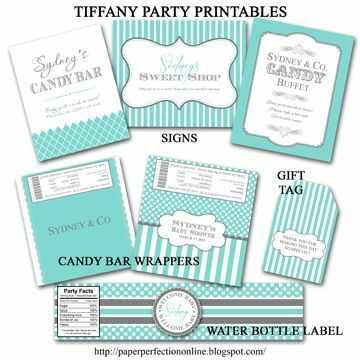 Below are the samples that I created for a tiffany blue party. 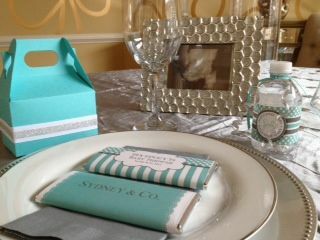 Some of the items that I created are meant to mimic the Tiffany store...who wouldn't want to receive a little blue box? If you would like custom party printables or some of the items pictured below contact Paper Perfection at jtanddolly@yahoo.com for pricing and details. Here is a picture that my client took of a mock up table place setting before the baby shower. Every occasion deserves the perfect invitation to help set the tone. Paper Perfection's goal is to make sure that when your guests receive your invitation there’s no way they’d want to miss the party or event! But it doesn't stop there, we are in the details and can create unique favors, place cards, menus, programs, welcome bags, monograms and so much more!